﻿When to transplant trees? Did you know that transplanting at the wrong time for most trees can result in less than satisfactory results? Yes, there is a right time and a wrong time to do it. Spring or fall is a good time to transplant most deciduous trees. This is their dormant season when there are no leaves on the tree. Optimally, fall transplanting is best done after there has been a couple of freezes (below 0-degrees C). 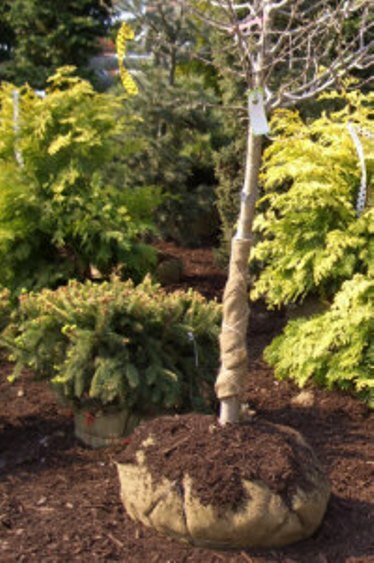 For spring transplanting it's best to wait until after the frost has lifted but before the tree begins to bud and leaf. If you'd rather leave it to the experts give us a call. If nature is not supplying at least one inch of rain water per week then you should water the trees liberally once a ★ week. The best watering procedure is to move your hose all around the base of the tree to effectively reach the entire root zone. Do it slowly. Let the water sink and repeat while making sure to cover all areas. Mornings are the best time to water. You don't want the leaves to remain wet over night because fungi does well in this environment. If you notice wilting this suggests the plants are getting too much water causing stress. Keep in mind that when plants are actively growing they need more water than when they are dormant. ★ If the trees are planted in compacted clay it would be wise to water every two weeks. The planting hole in this case acts like a barrel and will hold water for longer. This tends to suffocate the roots of the tree.